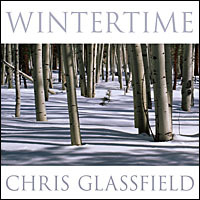 Chris Glassfield’s acoustic guitar masterpiece “Blue Glass” (which reached number one in the Classic/Jazz and New Age charts in Korea!) heralded the arrival on the international stage of an original composer and accomplished instrumentalist. The phenomenal success of this album across the Pacific Rim has helped earn him a growing reputation amongst serious music critics, Jazz and New Age fans alike. From a successful start in the vibrant progressive rock music scene of Liverpool in the late sixties-early seventies, Chris went on to study Classical Guitar at the local Mathey College before moving to London in 1977 to further his musical career. 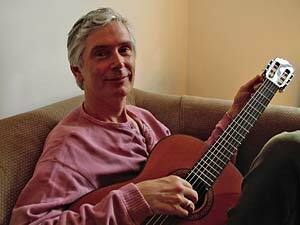 At this time he began to look for ways of combining his love of improvisation (especially jazz) with his newly acquired classical guitar techniques and formed Grand Union: a jazz-fusion band which featured amplified nylon-strung guitar. This band was popular in London and well received by critics, winning the Greater London Arts Council's Young Jazz Musicians Competition before going on to play successfully in England and Europe at such venues as the prestigious Ronnie Scott's Club. During this time Chris began writing and recording for TV and Radio as well as performing live both as a soloist and in bands. In 1982, sensing the limitations of the "Jazz Scene" and looking for fresh inspiration, he returned to full-time education to study Indian and other non-western music at Dartington College of Arts in Devon. After returning to London in 1986, he recorded his first album for New World Cassettes: Island - a collection of solo guitar pieces weaving together the disparate threads of Chris's restless musical past under the auspices of "New Age" music. This was followed by Ocean Blue which had a more orchestral concept and was featured behind the BBC2's test card. Then came a steady stream of successful recordings (including Libra - a best-seller for the Dutch label Oreade), until in 1999 Chris produced a double CD set with John Bundrick and collaborated with Canadian flautist Ron Korb to put together a successful tour of Japan and promote their joint album: Natural Friends. 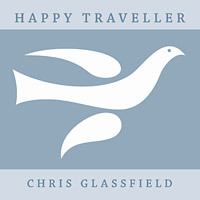 2008 has already seen Chris’s music used on TV and radio more than ever before, with examples ranging from BBC Radio 1's Breakfast Show to The Montel Williams Show in America; Histoires Oubliees (Discovery Channel); NHK News in Japan and Green Fog (a well known TV Drama in Korea) to name but a few. 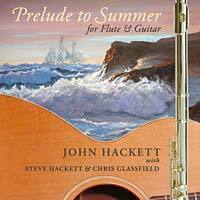 In addition, De Wolf Music released a new solo album: The Blue Guitar; and an exciting collaboration with flautist John Hackett has begun, with Chris joining Steve Hackett to contribute to his brother's new album Prelude to Summer (see below). The Asian connection also continues to flourish, with concert dates and appearances on national television successfully completed in Korea this Autumn. 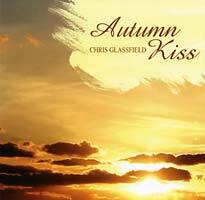 Chris Glassfield is one of a new breed of modern musicians: an imaginative yet disciplined performer who has worked hard to thoroughly master his instrument. He is equally at ease giving a classical recital or jazz concert and his unique, sensitive style is also very much at home within the "New Age" idiom. Chris now lives in Totnes, Devon, where a lively artistic community and delightful rural environment combine to stimulate and nurture his musical work. 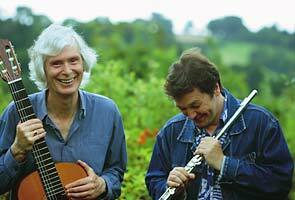 Glass Productions, 3 Stoyle House, 7 South Street, Totnes, Devon, TQ9 5DZ, U.K.
"A treat for Head, Heart and Ears!" Photos: Ayako Takada; Chris Hearnshaw. Symbiosis website designed and written by Clive Williamson of Symbiosis Music.